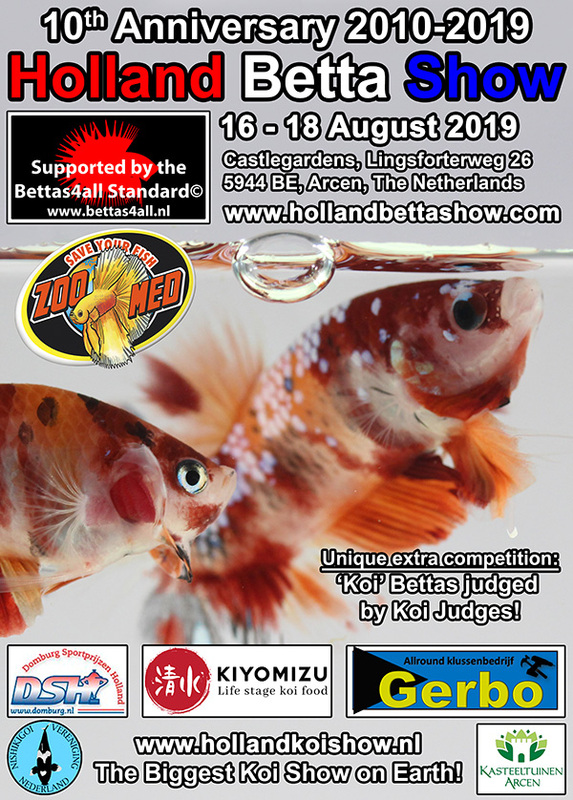 Bettas4all is proud to announce the 10th anniversary of the Holland Betta Show which will be held during the 27th edition of the Holland Koi Show in the beautiful Castle Gardens of Arcen, the Netherlands. The Holland Betta Show 2019 is an unique opportunity for Bettas4all to introduce our beautiful hobby to the public. A dedicated team of experienced betta hobbyists will provide you with all the necessary information with respect to the keeping, breeding and showing of show bettas. At the show ~400 show Bettas of different color and finnage varieties will be shown. All fish are self-bred by European hobbyists and will be judged on vitality, color, finnage, bodyshape and overall appearance by a team of experienced judges according to the Bettas4all Standard© to determine the winners of the various showclasses and the special prices. It will also be possible for the visitors to purchase some quality fish for a reasonable price. In 2016, we successfully introduced a new unique competition “Koi” Bettas judged by Koi judges!” to our show and we are happy to inform you that this competition will return at the 2019 edition of the Holland Betta Show. Besides being judged according to the Bettas4all Standard©, all “koi marbles” will be judged according to their pattern by certified Koi judges. Holland Betta Show 2010: 265 showbettas by 26 breeders of 7 European countries. Holland Betta Show 2011: 308 showbettas by 36 breeders of 6 European countries. Holland Betta Show 2012: 308 showbettas by 36 breeders of 7 European countries. 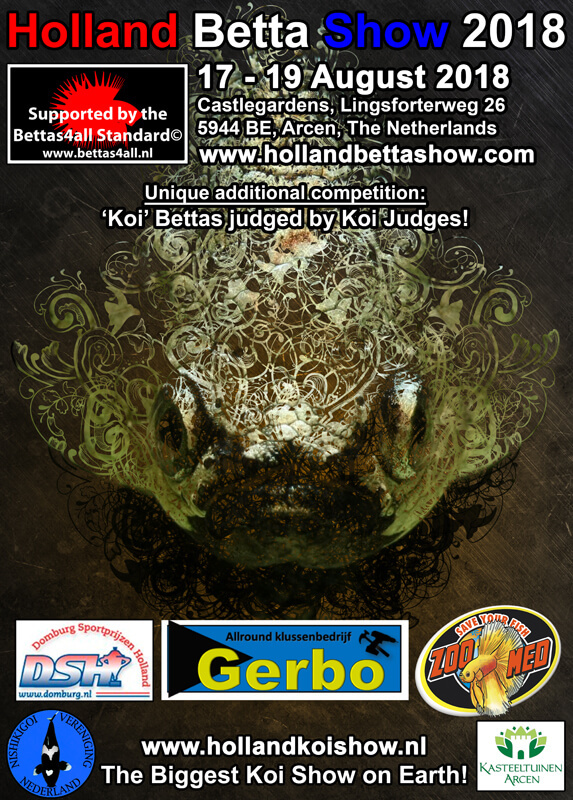 Holland Betta Show 2013: 308 showbettas by 36 breeders of 9 European countries. Holland Betta Show 2014: 308 showbettas by 34 breeders of 12 European countries. Holland Betta Show 2015: 308 showbettas by 45 breeders of 14 European countries. Holland Betta Show 2016: 356 showbettas by 50 breeders of 14 European countries. Holland Betta Show 2017: 354 showbettas by 51 breeders of 12 European countries. Holland Betta Show 2018: 392 showbettas by 49 breeders of 11 European countries. Registration will open on the 1st of July 2019 and will close when the show is fully booked. Benching of the fish takes place on Thursday 15th August 2019. We are looking forward to welcome you in the tent of the Holland Aquarium Show to come and see the Holland Betta Show for yourself. Please mark 16-18 August 2019 in your agenda! More the information with respect to visiting and/or participation at the Holland Betta Show 2019 can be found on this website and our forum. During the coming months this website will be regularly updated to provide you with all the necessary information.